It can be a bit of a challenge deciding which piano to buy if you don’t know what you’re looking for. Roland have an excellent reputation for building quality instruments and have a great selection of digital pianos under $2000. 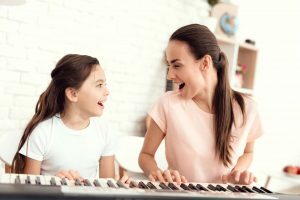 There are countless apps available that are designed to help you learn to play piano , no matter what level you are playing at! Metronomes help develop your rhythmic and timekeeping skills. Adjust the digital click to help you stay in ‘time’ and to master complex or advanced pieces of music. It helps to have a good idea of what you’re looking for when you go into the piano shop. With that in mind, let’s take a look at Roland pianos for under $2000, which have set the standard for pianos in this price range. The Roland RP501R is your ideal first piano and yet it’s ready to support you as you get more serious. This digital piano offers a wealth of practice-friendly features to suit developing players, with onboard rhythm accompaniment and Bluetooth® connectivity to iOS/Android piano apps. Better still, while other entry-level pianos are quickly outgrown, the Roland RP501R satisfies discerning players with its dynamic keyboard feel and authentic, responsive sounds. Combining premium features, a competitive price, and a compact-yet-robust cabinet, the Roland RP501R is ready to join your family. If you need a quality piano for home, classroom or live performance, the FP-60 is a fantastic choice. This portable digital piano for under $2000 offers both exceptional sound and touch. It is housed in a sleek, stylish cabinet that looks great and is easy to transport. The specially designed onboard speaker system produces rich, impressive sound with ample projection for performing at small venues. There is also a range of non-piano sounds allow you to cover a variety of musical styles. And with modern Bluetooth® wireless connectivity built in, you can connect a smartphone or tablet and enhance your playing and practice sessions with Roland’s Piano Partner 2 and other music apps. The FP-60 offers truly outstanding value, delivering premium piano quality in a streamlined instrument that travels anywhere. The F-140R is a digital piano built for modern life. With a contemporary, compact design perfect for smaller apartments, it’s also packed with useful technology from the leader in digital piano innovation. First of all, you’ll experience an authentic, expressive piano tone that’s nothing short of remarkable for such a compact and affordable instrument. The built-in stereo speakers project rich, full sound, while the Headphones 3D Ambience effect completely immerses you in your performance during private practice. Onboard rhythm accompaniments make playing even more fun, giving you control of a backing band that automatically follows the chords you play. Importantly, the F-140R can help improve your playing and composition too, because it comes complete with onboard recording, Bluetooth® connectivity for using with music score apps and a USB port for hooking up to a computer. Our piano takes pride of place in our living room and coming home to the sounds of someone playing always brings a smile to my face! It’s one of those things, like the smell of home cooked bread in the oven, that really turns a house into a home. Above all, it has opened my children to a lifetime of enjoyment. I hope that this short guide on finding the best digital pianos under $2000 has given you the inspiration and direction needed to take the next step! There is no time like the present to begin your musical journey.